By Keith Cowing on December 31, 2018 5:31 PM. By Keith Cowing on December 31, 2018 2:41 PM. By Keith Cowing on December 31, 2018 11:28 AM. "NASA's New Horizons spacecraft is on track to perform the farthest flyby in history, when it zips past a Kuiper Belt object nicknamed Ultima Thule -- more than four billion miles from Earth -- at 12:33 a.m. EST on Jan. 1. Flyby activities are taking place at the home of New Horizons operations, the Johns Hopkins Applied Physics Laboratory (APL) in Laurel, Maryland. A schedule of events, set for broadcast and streaming on NASA TV and social media channels, is below." By Keith Cowing on December 30, 2018 12:03 PM. "What this graph doesn't tell us, however, is who specifically was the most famous person to die in 2018. To calculate this, we need a means to measure an individual's level of fame. And this is where we can borrow a trick from Google. The search engine ranks results by counting the number of pages linking into a given page - the theory being that the more pages linking there, the more authoritative it is. And using this Wikipedia data, we can do something similar: We can count the number of other Wikipedia pages linking to the dead person. The bigger the number, the bigger the impact that person had on our world." "10 - Paul Spudis - Aug. 29 - Scientist - 1502"
By Keith Cowing on December 29, 2018 11:48 AM. "Undeterred by the barriers to women in the sciences, Dr. Roman found a professional home at NASA. Even there, she recalled in an interview years later, she felt compelled to use the honorific "Dr." "Otherwise," she said, "I could not get past the secretaries." After joining the fledgling space agency in 1959, Dr. Roman became the first chief of astronomy at NASA headquarters, a role that made her one of the agency's first female executives. She remained in that position for nearly two decades before her retirement in 1979." By Keith Cowing on December 28, 2018 11:24 AM. "During the Shutdown Furlough, you will be in a nonpay, nonduty status. During this time, you will not be permitted to serve NASA as an unpaid volunteer. You must remain away from your worksite, and may not work at home, in another location, or participate in events hosted by non-NASA entities in your official capacity like speeches or speakers bureau engagements, unless and until recalled." Keith's 27 Dec note: It would seem that NASA Administrator Bridenstine and NASA SMD AA Zurbuchen are prohibited from attending or even talking about anything having to do with the New Horizons flyby of Ultima Thule. "NASA is currently CLOSED due to a lapse in Government funding Orderly Shutdown Will Begin December 26, 2018"
"Trump has argued that federal workers support the shutdown, saying Tuesday, "Many of those workers have said to me and communicated, 'stay out until you get the funding for the wall.' These federal workers want the wall, " according to an ABC News story published on Christmas Day. In its statement, the union said Trump needs to stop "gambling with the lives of federal workers." "If the president wants to gamble, perhaps he should go back to running casinos," the statement said." "Most recently, a simulated spacecraft resembling Orion's actual article underwent and aced noise-related tests. Engineers collected data to input into Orion's actual article, ensuring, upon a scheduled 2021 launch, the spacecraft can withstand extreme vibration it'll likely encounter in space. Depending on the shutdown's length, a federal holdup could push back several crucial Orion-related experiments scheduled for 2019 at Plum Brook. Before then, Plum Brook's staff has prepared for these tests, analyzing data gathered from past trial runs. Though the stoppage means these workers and others contracted to work with NASA at Plum Brook on other projects must stand idle and wait for who knows how long." By Keith Cowing on December 27, 2018 6:11 PM. By Keith Cowing on December 24, 2018 12:36 PM. By Keith Cowing on December 23, 2018 12:22 PM. Keith's 9:30 am ET note: Apparently the NASA Deep Space Network Now website only operates with human intervention - NASA civil servant intervention, to be specific. If you visit the site now it is online but it does not show any activity on the DSN. There is a clock in the upper former that shows that it is updating. Obviously the DSN is still talking to spacecraft such as New Horizons during the government shutdown. But the software that talks to the DSN and makes the squiggly lines appear over the antenna icons can only operate while a civil servant is doing something. But wait: the DSN itself and the DSN Now website are run by JPL which is part of Caltech - not NASA. 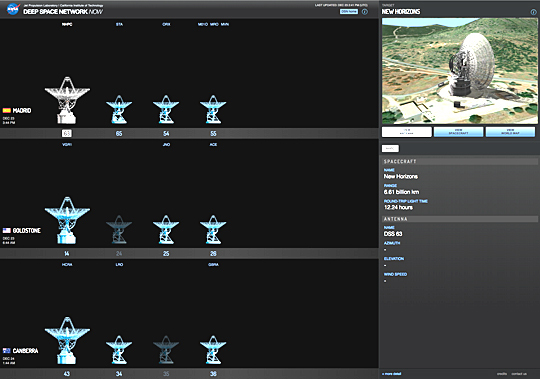 Why has JPL shut down the data feed to the DSN now website? Are they trying to make a point or is the set up so fragile that lack of a civil servant makes it break? I'd ask JPL PAO but they do not respond to media inquiries these days. But someone will post a snarky explanation on Twitter, I'm certain. Larger image. Keith's 12:22 pm update: It is working again - for now. By Keith Cowing on December 22, 2018 12:38 PM. Keith's update: S. 3277 failed passage on the House on a 239 -137 vote under a suspension of the rules wherein debate is limited, no amendments allowed, and a 2/3 majority is required for passage. "Senate Bill 3277, which was introduced in July with Texas Republican U.S. Sen. Ted Cruz as primary sponsor and Nelson and Democratic U.S. Sen. Ed Markey of Massachusetts as the co-sponsors, was approved unanimously Thursday. It's closest companion, House Resolution 2809, was approved in the House of Representatives in April, though there are some significant differences. SB 3277 includes a number of provisions, many of them offered by Nelson, which would streamline and clarify the roles played by NASA, the Federal Aviation Administration and other agencies in promoting the commercial space business, and extend and expand NASA's program to work with such private space companies such as SpaceX and Blue Origin at centers such as Kennedy Space Center." "This bipartisan bill is a strong statement in support of America's growing commercial space industry. It would update space transportation regulations and commit to the full use of the International Space Station through 2030 for critical commercial and scientific purposes. We look forward to working with members of Congress next year to get commercial space legislation passed and signed into law, ensuring American space presence and dominance into the future." The House brought up the Space Frontier Act under Suspension of the Rules a little bit ago. House SS&T Chm Smith gave a lukewarm speech about it, but recommended that it pass. At the conclusion of debate, the yeas and nays were ordered. The vote will be taken later today. By Keith Cowing on December 21, 2018 11:10 PM. "Pursuant to OMB Circular A-11, Section 124.2, NASA is hereby submitting a revised shutdown plan in the event of a lapse in appropriations, updating the plan submitted to OMB on September 25, 2015, In this plan, NASA continues to require each NASA Center to provide for protection of life and property. The Decision on what personnel should be excepted from furlough is very fact-specific , and DIrectors in charge of NASA Centers are in the best position to make detailed decisions regarding the suspension of ongoing, regular functions which could imminently threaten the safety of human life or the protection of property." - Space launch hardware processing activities, which are necessary to prevent harm to life or property. - Tracking, operation, and support of the ISS and operating satellites necessary for safety and protection of property. - Completion or phase-down of research activities in cases where serious damage to property would result from temporary suspension of the activity." By Keith Cowing on December 21, 2018 11:00 PM. "Our work at NASA is difficult, but it is important. Below is a list of many of NASA's biggest accomplishments of 2018. They are the result of your hard work, talent, dedication and passion. I look forward to working with all of you in 2019 as we continue moving forward to the Moon and on to Mars." By Keith Cowing on December 21, 2018 5:41 PM. NASA Leads In Astrobiology. It Needs To Act That Way. By Keith Cowing on December 21, 2018 12:01 AM. Keith's note: Yesterday I posted an item "NASA Is Incapable Of Explaining How It Does Astrobiology" about Astrobiology-related news from NASA that made no mention of NASA's Astrobiology program. I sent an email about this to all of the people at NASA who run Astrobiology. No response. But they did update their websites. Lets try again. Two reports were issued yesterday. One, by the National Academy of Sciences (paid for by NASA ~$1 million) covers the issue of how NASA will collect, store, and analyze samples it returns from across the solar system, many of them with overt Astrobiology significance. The other report has to do with a NASA-funded workshop on how to detect indications of extraterrestrial civilizations via their technologies. There is no mention of this article at the NASA Astrobiology web page or at the NASA Astrobiology Institute webpage. To be fair, NASA does publish a lot of stuff about Astrobiology. Its not like they are completely asleep at the wheel. Then again, they seem to be behind the curve when it comes to the broader aspects of Astrobiology beyond the quirks of NASA's internal budgetary management. They also seem to miss a lot of the broader impacts of the field Astrobiology extending beyond NASA's funding scope - but done as a result of the field that NASA can claim to have established. They are reactive when they should be proactive. FWIW I was there at the first Astrobiology meetings in 1996/1997. Alas, NASA seems to have lost its mojo when to comes to asserting its leadership in this field. Its time to change that. Google "astrobiology". In the U.S. the 3rd search result is my website Astrobiology.com. Maybe I know something. NASA has decided to reboot their whole Astrobiology thing. Maybe they will take the issue of being cutting edge in terms of discussing research and opinion - everyone's research and opinions. "NASA's investment in new instruments to analyze extraterrestrial samples is insufficient to provide for replacement of existing instruments, says a new report from the National Academies of Sciences, Engineering, and Medicine. If NASA does not invest additional funds into the replacement of current instrumentation and development of new technologies, technical staff support, and training for the next generation of analysts, current capabilities cannot be sustained, and the full scientific impact afforded by returned samples might not be realized." "This report is the product of the NASA Technosignatures Workshop held at the Lunar and Planetary Institute in Houston, Texas, in September 2018. This workshop was convened by NASA for the organization to learn more about the current field and state of the art of searches for technosignatures, and what role NASA might play in these searches in the future. The report, written by the workshop participants, summarizes the material presented at the workshop and incorporates additional inputs from the participants." By Keith Cowing on December 20, 2018 6:46 PM. By Keith Cowing on December 20, 2018 4:46 PM. "Today, the House of Representatives unanimously approved S. 7, the NASA Enhanced Use Lease Extension Act of 2018, sponsored by Senator Roger Wicker (R-Miss). The bipartisan bill is now on its way to the President's desk. S.7 enables commercial access to valuable NASA infrastructure and facilities. NASA's enhanced use lease authority gives NASA a crucial tool to partner with the private sector." By Keith Cowing on December 19, 2018 11:55 PM. "New research suggests that the sugar molecule that puts the "D" in DNA - 2-deoxyribose - could exist in the far reaches of space. A team of NASA astrophysicists were able to create DNA's sugar in laboratory conditions that mimic interstellar space. The researchers believe their results, published on Tuesday in Nature Communications, show that yet another of life's critical chemical building blocks could be widespread in the universe and potentially seed other planets as well." Keith's note: This article is about a topic at the core of Astrobiology - the origin and distribution of biogenic compounds and precursors. The only place that "astrobiology" appears on this web page is a tag at the end. The article is featured on the NASA home page but there is no mention of this article at the NASA Astrobiology web page or at the NASA Astrobiology Institute webpage It is just baffling that NASA puts things like this out which feature what NASA's Astrobiology Program does - without ever mentioning it. The article originates from NASA Ames - the home of the NASA Astrobiology Institute - and the origin of NASA's Astrobiology program in the late 1990s. You'd think that Ames would want to plug their role in supporting NAI - they have a link to the article but no mention of the NAI. Yes, yes, I know that different funding streams fund different things but in the end its all part of NASA's Astrobiology efforts. By Keith Cowing on December 19, 2018 6:31 PM. Keith's note: The last two times there was a data breach I was directly affected since I am a former NASA civil servant even though I left the agency 25 years ago. I also underwent a FBI security scan to get a press badge at NASA HQ 15 years ago. I sent an email to NASA HQ PAO, Human Resources, and CIO yesterday asking how media and former employees are affected by the latest security breach. This is the response I got. It is pointless to send me to the website since I am no longer a NASA civil servant and I do not have a "Smart Card" to log in. So I called the phone number. They never bothered to ask me for my case number (so why was I given one?). A recording of the call is below. Clearly NASA is not prepared for handling responses to former NASA employees about this topic. Note: I am in Virginia which is a "one party" state when it comes to recording phone calls (which I never do if you call me BTW). This is a customer service call that I think is worth sharing. Fax (support documentation only): (888) 525-6497"
By Keith Cowing on December 19, 2018 5:16 PM. "On Oct. 23, 2018, NASA cybersecurity personnel began investigating a possible compromise of NASA servers where personally identifiable information (PII) was stored. After initial analysis, NASA determined that information from one of the servers containing Social Security numbers and other PII data of current and former NASA employees may have been compromised." Keith's note: According to NASA HQ PAO the latest security breach at NASA does not affect people outside of NASA who may have interacted with NASA security. But people who work or used to work at NASA are at risk. So y'all can expect another "Dear NASA Employee" letter from the agency offering free credit monitoring services. 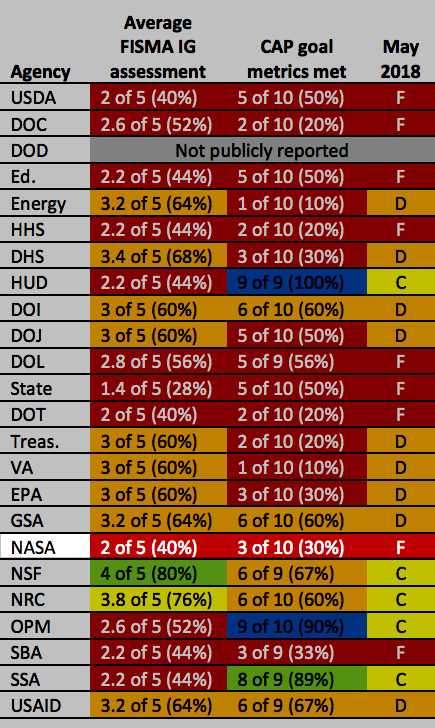 NASA's performance in complying with Federal regulations governing IT and cybersecurity has been pitiful - especially during the tenure of NASA CIO Renee Wynn. Now there has been another security breach that affects all present and prior NASA employees - even those of us who left the agency decades ago. In the real world the person responsible for such pitiful performance would be fired. "Congress enacted the Federal Information Security Modernization Act of 2014 (FISMA) to improve federal cybersecurity and clarify government-wide responsibilities. The act is intended to promote the use of automated security tools with the ability to continuously monitor and diagnose the security posture of federal agencies, and provide for improved oversight of federal agencies' information security programs. In particular, the act clarifies and assigns additional responsibilities to entities such as OMB and DHS." "There is a slightly goofy post at NASA CIO's Open.NASA.gov (not findable on the NASA search engine) "NASA's Approach to Implementing FITARA" from 10 March 2016 that opens with "My husband and I are planning a vacation to Disneyworld, an awesome destination for our five year old dreamer. How do we budget for such an grandiose trip? ", and then goes on to spout happy talk - with added IT word salad - about how seriously NASA takes FITARA. If only." By Keith Cowing on December 19, 2018 12:16 PM. Keith's update: Sources report that CASIS Executive DirectorJoseph Vockley has actually been asleep at the wheel at CASIS. Literally. CASIS employees say that he falls asleep at both internal CASIS and external meetings - including those held with NASA. Vockley has stated to many people that he is really not in charge at CASIS - and that Melody Kuehner, the CASIS Human Resources Manager and Board Secretary, actually runs the organization. This is how NASA plans to convert ISS into a fully commercial venture - the people in charge at CASIS are not actually in charge. Keith's 11 December note: CASIS, the non-profit created to run the ISS National Laboratory, has been on a hiring spree of late. Three high level executives have been hired at $300K+ annual salaries recently. Meanwhile, existing CASIS staff are not getting cost of living increases and having their vacation benefits cut. It would seem that no one is going to fix the big, lingering problems at CASIS. Joseph Vockley was recently hired as the new Executive Director of CASIS. He has zero experience with space but he's pulling in a salary close to $400k a year. In addition to Vockley CASIS has hired CASIS Chief Strategy Officer, Richard Leach (an old buddy of Vockley's) and Vice President Christine Kretz. Neither of the positions filled by Leach or Kretz were advertised. Neither Kretz or Leach have any space experience. When you ask Bill Gertsenmaier and Jim Bridenstine how they will be certain that the ISS will be able to be taken over by commercial funding when NASA pulls out, they point to CASIS as the prime solution to that looming problem. CASIS' response is to hire new leadership with no basic space flight experience. This is not what you'd expect an organization that needs to beef up its space commercialization skill set would be doing to meet that challenge. Indeed, CASIS is still unable to use all of the crew and other resources that NASA offers it on the ISS. We've been looking into the CASIS mess since its inception. In the past year Bill Gerstenmaier finally seemed to have gotten the message and had his staff tell CASIS to clean up its act after years after year of underperformance. In "Is CASIS Fixing Its Management Problems?" the series of NASA and CASIS interactions on management are examined. Alas, it would seem that CASIS was only paying lip service to NASA's concerns and NASA is utterly disinterested in making CASIS do the job that they are being paid to do. By Keith Cowing on December 18, 2018 5:20 PM. "On Oct. 23, 2018, NASA cybersecurity personnel began investigating a possible compromise of NASA servers where personally identifiable information (PII) was stored. After initial analysis, NASA determined that information from one of the servers containing Social Security numbers and other PII data of current and former NASA employees may have been compromised. Upon discovery of the incidents, NASA cybersecurity personnel took immediate action to secure the servers and the data contained within. NASA and its Federal cybersecurity partners are continuing to examine the servers to determine the scope of the potential data exfiltration and identify potentially affected individuals. This process will take time. The ongoing investigation is a top agency priority, with senior leadership actively involved. NASA does not believe that any Agency missions were jeopardized by the cyber incidents." By Keith Cowing on December 18, 2018 11:01 AM. "President Donald Trump will order in the coming days the establishment of a new military space command, a move that comes as Vice President Mike Pence plans two high-profile visits related to the US space program, three US officials tell CNN. Pence will visit Kennedy Space Center at Cape Canaveral on Tuesday, and is expected to visit the Pentagon this week, in part to discuss Trump's sought-after Space Force. The new Space Command will be only the 11th combined combatant command, joining the ranks of Central Command, which oversees military operations in the Middle East, and Special Operations Command, which oversees elite troops known as Special Operations Forces. The White House did not respond to requests for comment." "Pursuant to my authority as the Commander in Chief and under section 161 of title 10, United States Code, and in consultation with the Secretary of Defense and the Chairman of the Joint Chiefs of Staff, I direct the establishment, consistent with United States law, of United States Space Command as a functional Unified Combatant Command. I also direct the Secretary of Defense to recommend officers for my nomination and Senate confirmation as Commander and Deputy Commander of the new United States Space Command. I assign to United States Space Command: (1) all the general responsibilities of a Unified Combatant Command; (2) the space‑related responsibilities previously assigned to the Commander, United States Strategic Command; and (3) the responsibilities of Joint Force Provider and Joint Force Trainer for Space Operations Forces. The comprehensive list of authorities and responsibilities for United States Space Command will be included in the next update to the Unified Command Plan"
By Keith Cowing on December 17, 2018 4:01 PM. By Keith Cowing on December 17, 2018 1:13 PM. "Rona Ramon, the widow of Israel's first and only astronaut, died of pancreatic cancer Monday at age 54. Ramon's husband, Ilan Ramon, was a crew member on America's 2003 Columbia space shuttle mission when the spacecraft blew up, killing all on board. Rona Ramon later lost her son Asaf, an Israel Air Force fighter pilot, in a training accident. She subsequently established the Ramon Foundation to promote academic excellence and social leadership among Israel's young people." "From the an event held on the one year anniversary of Columbia's loss at the Israeli embassy in Washington, DC: "At the end of the event, Rona Ramon, Ilan's widow, spoke last. "Our mission in space is not over" she told the hushed audience. "He was the first Israeli in space -- that means there will be more." By Keith Cowing on December 16, 2018 1:04 PM. By Keith Cowing on December 15, 2018 1:28 PM. "The camp at Lake Untersee is now closed, we pulled the last three tents down early yesterday morning and completed packing our cargo into the sea container with the remainder going onto the other two cargo sleds. The traverse back went well and we are all back at Novolazarevskaya Station, now at the ALCI operated "Oasis Huts" just adjacent to the Russian Station Novolazarevskaya. We have stayed in the Oasis Huts many times over the years so it is like returning to our home away from home - warm beds, good food and hospitality and a place to wash off the last six weeks of wear and tear we have all accumulated. These huts, refurbished a few years ago, were built in the early 1960's by the Russian Antarctic program - the initial Novolazarevskaya Station - so it is always nice to be staying somewhere with an interesting history. ... All in all a great field season and we accomplished most of what we set out to do. Now it is time to head home, relax a bit over the holidays and then begin working on returned samples, analyzing data and planning for future work in this region." By Keith Cowing on December 14, 2018 5:26 AM. Keith's 14 December note: NASA has a new Associate Administrator for the headquarters Office of Communications: Bettina Inclán. According to her Twitter profile at @BettinaInclan: "Entrepreneur. Storyteller. Political junky. Tired mom of 2 boys. Wife. Wine enthusiast. Proud Latina. Alum of Capitol Hill @GOP @RNCLatinos @NRCC Romney, McCain". "A congressional candidate from Miami can go one better: Bettina Rodriguez Aguilera says she's been aboard a spaceship too. But this one was crewed by aliens. As in extraterrestrials. ... Rodriguez Aguilera, 59, a Republican who is running to replace retiring Miami Republican Rep. Ileana Ros-Lehtinen, recounted her experience with the ETs during a 2009 television interview." ... Rodriguez Aguilera's daughter is former Republican National Committee Hispanic outreach director Bettina Inclán Agen. Her son-in-law, Jarrod Agen, is Vice President Mike Pence's deputy chief of staff." "The video portrays a woman sitting across a restaurant table from a cardboard cut-out of Obama. "You think I didn't see you with Sarah Jessica Parker and George Clooney?" the woman asks. "It's not me, it's you." But perhaps it is the woman. The actor depicting a disillusioned Obama supporter from 2008 is actually the RNC's Director of Hispanic Outreach Bettina Inclan. "You're just not the person I thought you were," Inclan tells cardboard Obama in the ad, while pretending to be someone she is not." By Keith Cowing on December 14, 2018 12:03 AM. 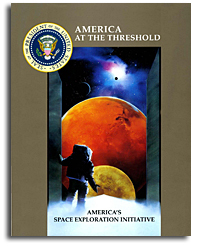 Keith's note: In September 2004, I was sitting in the auditorium at the Naval Postgraduate School in Monterey, California in the final session of the NASA Administrator's Symposium "Risk and Exploration: Earth, Moon and the Stars". 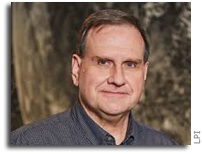 I co-chaired this event with Astronaut/NASA Chief Scientist John Grunsfeld. NASA Administrator Sean O'Keefe departed the event early so as to fly in and be at Mojave for the attempt at winning the XPrize. We watched a live video feed in the meeting room. There was a scary moment at one point - actual risk, as was the discussion at our event - and then success at 100 km/62 miles - landing - and then celebration. Yesterday's flight by Virgin Galactic, albeit to a lower altitude, is a milestone of sorts - one that was only won with a lot of hard work and ultimate sacrifices by multiple employees. When one enters "space" is a matter of definitions and opinion. In 2004 it was 62 miles. Yesterday it was 51.4 miles. Whatever. You can call them and ask why they picked the easier goal to strive for. That said, and numbers not withstanding, a lot has been invested in this. Soon, paying customers will ride close to - or (depending upon your opinion) into "space". The formal definition is somewhat arbitrary but still a matter of formal definition that can always be adjusted. OK, so who cares. From where SpaceShipTwo was poised, Earth's curvature is obvious. There is no air outside. And your blood would boil if you opened the door. Its outer space. Deal with it. NASA is no longer the only way to get there. A few years ago I completed the Suborbital Astronaut Certification program at NASTAR. I flew several full acceleration profiles in a world class centrifuge based upon data from the original SpaceShipOne flight. I was pumped and tried to bribe the centrifuge operator for a third flight. Anyone in resonable health can do this. You just need several hundred thousand dollars to spare. That is the greater challenge. FWIW Virgin Galactic is hyper-sensitive to media depictions of their events. Some media outlets have dumped on them relentlessly for reasons that remain obscure. Despite rather positive depictions of their efforts and lots of off-the-record chats with staff over the years about how to do media, NASAWatch was not invited to cover this event. OK. That's your call George. Nice spaceship. By Keith Cowing on December 13, 2018 10:53 AM. "The historic achievement has been recognised by the Federal Aviation Administration (FAA) who announced today that early next year they will present pilots Mark "Forger" Stucky and Frederick "CJ" Sturckow with FAA Commercial Astronaut Wings at a ceremony in Washington DC. CJ, as a four-time Space Shuttle pilot, will become the only person to have been awarded NASA and FAA wings." Keith's note: Virgin Galactic's SpaceShipTwo reached an altitude of 51.4 miles today after 15 years of struggles to replicate the performance of SpaceShipOne in 2004. AFter some additional tests commercial passengers will reportedly be carried. But did they go to "space" today? According to Wikipedia "The Kármán line, or Karman line, lies at an altitude of 100 km (62 mi; 330,000 ft) above Earth's sea level and commonly represents the boundary between Earth's atmosphere and outer space. This definition is accepted by the Fédération aéronautique internationale (FAI), which is an international standard-setting and record-keeping body for aeronautics and astronautics. ... The U.S. Air Force definition of an astronaut is a person who has flown higher than 50 miles (80 kilometres) above mean sea level, approximately the line between the mesosphere and the thermosphere. NASA formerly used the FAI's 100-kilometer (62 mi) figure, though this was changed in 2005, to eliminate any inconsistency between military personnel and civilians flying in the same vehicle." Virgin Galactic's SpaceShip Two only reached 51.4 miles. So that's not "space" if you accept the decades-old internationally-accepted definition. Ironically, all of the hoopla and arm waving in 2004 when SpaceShipOne won the XPrize happened only after it had passed the 100km/62 mile Karman line. It took Virgin 15 years to almost make the same altitude again. But now there's an effort a foot to lower the internationally-accepted altitude to make it easier to reach "space". But no one has formally adopted that yet, As such it looks like Virgin Galactic jumped the shark to some extent for the purposes of marketing, etc. In some countries and from the perspective of some regulatory agencies, they did not reach "space" - yet. Just sayin'. By Keith Cowing on December 12, 2018 10:11 PM. "Enter Bridenstine ... who says Curry's claim is so outrageous -- the point guard just cannot be serious. "I think it's funny," Jim tells us ... "I can't imagine he really believes that. It's outside the realm of what's possible." In fact ... Jim REALLY set Steph straight, saying, "Here's the thing, we didn't just go to the moon once, we went to the moon six times! And, we did it from 1969 to 1972!!!" Bridenstine also doubled down on NASA's invitation to have Curry come check out all their evidence -- saying he'd LOVE to prove Steph wrong and get him involved in the space program afterward! "My son is a HUGE fan of Steph Curry. So, if we can get him involved in space, I'm for it!" "But in terms of the reaction that I've gotten, I am definitely going to take [NASA] up on their offer. I am going to educate myself firsthand on everything that NASA has done and shine a light on their tremendous work over the years. And hopefully people understand that education is power, informing yourself is power. For kids out there that hang on every word that we say, which is important, understand that you should not believe something just because somebody says it. You should do your homework and understand what you actually believe." Keith's note: There are a lot of people who did not pay attention in science class when they were growing up. A lot of other people are hit from a hundred different directions by conspiracy theories and fiction portrayed so realistically that they think it is fact. Other people just like to kid around. Some people simply do not care about NASA or space. Its not NASA's fault that people get these ideas in their head - for whatever reason they end up thinking these things. The easy thing to do is to dismiss instances like this when other people genuinely doubt the Moon landings. But then there's the chance to take a celebrity's incomplete knowledge of the historic achievements of NASA's Apollo program and convert it into a teaching moment. Stephen Curry has quickly admitted that he was kidding but sees the chance to turn a bunch of arm waving by the news media into something far more useful. As former NASA Administrator Sean O'Keefe used to say in reference to his Jesuit schooling, "you make converts one at a time". By Keith Cowing on December 10, 2018 7:37 PM. NASA's Solution To Operating A Human Facility Like Gateway: Droids. By Keith Cowing on December 10, 2018 2:58 PM. Boeing Has No Idea Who Is Buying Their Satellites. Or Do They? By Keith Cowing on December 9, 2018 6:58 PM. "Boeing has canceled a deal to build a communications satellite -- which it has almost completed -- on the basis that the startup that ordered it has defaulted on payments. The sudden cancellation, however, comes on the heels of a report that detailed how the project was actually financed by a firm owned by the Chinese government. The Wall Street Journal exposed the situation earlier this week. The startup that ordered the satellite is called Global IP, and it wanted to use it for African Internet access. However, the deal was financed by an outfit called China Orient Asset Management, which is owned by the Chinese finance ministry and bankrolls military technology suppliers in the country. According to that report, some national security officials suspected Boeing was trying to bypass a ban on selling satellites directly to China. The ban is in place because of fears over the Chinese military gaining access to sensitive technology." "Two leading American aerospace companies have agreed to pay a record $32 million in penalties to settle civil charges that they unlawfully transferred rocket and satellite data to China in the 1990's. The agreement, which was completed on Tuesday and released today, comes two months after the State Department accused the companies, Hughes Electronics Corporation, a unit of General Motors, and Boeing Satellite Systems of 123 violations of export laws in connection with the Chinese data transfers. In a joint statement the companies said they ''express regret for not having obtained licenses that should have been obtained'' in the 1990's by a Hughes unit, the Hughes Space and Communications Company, which was acquired in 2000 by Boeing." Keith's note: This has happened before. And this time Boeing only discovered the Chinese financing of this satellite in the past few days when the Wall Street Journal figured it out? Really Boeing? By Keith Cowing on December 9, 2018 6:39 PM. Keith's note: The NASA Advisory Council's Human Exploration and Operations Committee is having problems trying to explain why NASA needs to build the Gateway. If they can't figure out why it is needed, how is NASA going to sell this whole Gateway thing to Congress and the taxpaying public? NAC/HEO is currently debating a list of points that can be used to justify Gateway which is, so far, six pages long (in large type). A woman cmte mbr, though, says that Gateway is only needed if we're going to Mars. By Keith Cowing on December 7, 2018 12:20 PM. Keith's note: This comment was posted in response to this NASAWatch post. I hear this a lot - sadly with increasing frequency. "This (below) was written on FACEBOOK this week. I know the person who wrote it and it speaks volumes on why NASA should no longer develop rockets. "Thursday will be my last day to work. I don't retire until 3 January, but I will be on leave. I hate to end on such a low note, but it's that or go bonkers. I dared to speak up on a safety issue on the new launch vehicle a couple of years ago and I got shuffled into a useless and meaningless job. I do little to nothing and when I ask for more work, I get nothing. They won't let me transfer either. I've been fighting to move and no manager in my chain of command will lift a finger. So much for speaking up. Certain managers at NASA made my dream job into a nightmare. You can't buck the system even when they tell you that it's your job to do so. I hope that nothing bad comes of the issue but my conscience is clear. I made a safety concern known. Anybody need a slightly used engineer?" By Keith Cowing on December 6, 2018 3:27 PM. "Part of the problem here, though, is NASA's reluctance to talk about both the problem and the plans to fix it. The presentation, shared during the Payload Operations Integration Working Group meeting back in April, was approved for unclassified and unlimited public release and placed on the NASA Technical Reports Server in early September. I asked for an interview about it on September 25. The next day, the presentation was gone. "The record details page you tried to access cannot be found on this server," the page now says. I inquired about the dead link, and more than three weeks later, I received a response: "The document is under review," wrote Meagan Storey, of the NASA Scientific and Technical Information Program, "and we advise that you make a FOIA request for the item." Statistically, that's probably a losing prospect." By Keith Cowing on December 6, 2018 3:06 PM. Keith's note: There is yet another space policy event in Washington, DC today aimed at another session of choir practice in an echo chamber by the proverbial usual suspects in the space policy clique. Its an event by the U.S. Chamber of Commerce launching some sort of commercial space thing. Registration for the even closed a while back and only a few media representatives were allowed in. Of course, as is typical of these events the sponsors did not bother to webcast anything. Who cares. These events are all about talking about doing things instead of actually doing the things that they talk about. Given that there is a Chamber of Commerce in virtually every community in America this could have been an excellent opportunity for the U.S. Chamber of commerce to go into grass roots mode and educate the remaining 99.999% of the population - the ones who pay taxes or work in companies that build space hardware. But no - these policy wonks are only interested in talking to each other and being quoted in trade publications that only they and their friends read. But there was an exception to this cloistered event: NASA Administrator Bridenstine had someone on his staff stream his keynote speech live via a streaming account registered to @JimBridenstine on their cellphone. He does things like this a lot. Much of it is spontaneous - and much of it is done on his cellphone by him using his own actual fingers. He gets it. There is no reason why any event anywhere cannot be shared with anyone, anywhere. So long as there is cellphone and/or WiFI access you have a means to reach a vast audience. Yes, the quality is sometimes shaky. I call this the "Max Headroom effect". If you are not familiar with this then go Google the name. Of course its shaky - its being done via a cellphone. The point is that while the quality may be lacking, it is understandable, and it is live, and it is being done so that you can participate - wherever you are. In 2009 I spent a month at Everest Base Camp at 17,600 feet doing education and public outreach with the Challenger Center as Astronaut Scott Parazynski climbed Everest. We had a commercially available HS 9210 BGAN satellite unit. I carried it to Everest on my back. With it we did live webcasts almost daily with Miles O'Brien who used his laundry room in New York City as our media command center. The quality was often lacking but, in pure Max Headroom mode, we did live webcasts from an extremely remote place where few had done such things before - because we could. Now its easy to do things like this from Everest since there are people selling WiFI access and you can use your cellphone - the same access that people in these space policy meetings have. Oddly, a community that hypes the space spinoff benefits to the economy - including space-based communication satellites - is incapable of using the same resources to do a simple webcast from their events - something that kids in junior high school know how to do. There is also this fetish with costs - and ignorance thereof. Space meeting organizers think that webcasts using cellphones and laptops need to be fancy or cost a lot of money. Yet they spring big bucks for expensive stage props and luncheons for their pals at these events. Its all about appearances - not substance. People in the space industry are always keen to sniff for hints from NASA leadership as to what they are interested in so as to be able to say the right buzz words back to NASA and offer products and services that NASA seems to be interested in. OK: here's a hint: the Administrator of NASA personally streams live video of his comments on social media. He does so without an army of expensive contractors on the cellphone in his pocket. He is trying to reach people that have heretofore remained beyond the reach of NASA's traditional education and public outreach mechanisms. When big aerospace companies and associations want to send messages to their audiences they buy full page ads in the Washington Post or blanket Metro stations near Capitol Hill with giant banners. Bridenstine uses his cellphone with the ability to reach a vastly bigger audience. Bridenstine is also sending a message to traditional aerospace community: they need to adapt to his new mode of communication if they want to remain relevant. He is going directly to taxpayers and other stakeholders and bypassing the long-standing system that trade and advocacy groups have usually held a grip on. He's already got a head start and he's not looking back. By Keith Cowing on December 5, 2018 2:17 PM. Keith's note: SpaceX successfully placed a Dragon cargo vehicle into orbit today. Alas, as it returned to Earth, the Falcon 9's first stage lost control and it landed in the ocean. By Keith Cowing on December 5, 2018 2:04 PM. "The new president was offering NASA, which at the time lacked a clear mission for its human spaceflight program, a lifeline, guaranteeing his support for an assertive Space Exploration Initiative (SEI). But the fiscal realities of the late 1980s, when budget deficits had exploded, required the organization to think in a new way. NASA, however, wasn't up to the job. Rather than thinking innovatively and offering new ideas for reaching the moon and Mars, the agency simply recycled concepts that had been dominant within the space program since its earliest days. Its plan included the construction of a substantial in-orbit infrastructure, where massive spacecraft for lunar and Mars exploration would be assembled before departing for their final destinations. Each alternative pathway identified by a study team required enormous capital expenditures. Over a 30-year implementation period, this initiative would have cost more than $500 billion. This would have required more than doubling the agency's budget. The tone-deafness of NASA's plan shocked the National Space Council. NSC Executive Secretary Mark Albrecht called it "the biggest 'F' flunk, you could ever get in government. . . . It was just so fabulously unaffordable, it showed no imagination." The report quickly turned Capitol Hill against the space agency, with one key congressional aide stating that SEI was dead on arrival." Keith's note: NASA is heading down this path again. Uninspiring plans that rely on budgets that simply will not be there. Two Presidents named Bush pushed NASA to send humans back to the Moon and then on to Mars. 30 years after the first and 15 years after the second Bush proclamations, we still have not gone to either location. As the old saying goes, "Fool me once, shame on you. Fool me twice ..."
Searching For That Next "Greatest Generation"
By Keith Cowing on December 5, 2018 12:00 AM. Keith's personal note: I just can't get over this video. My father died a few months ago. He was a few weeks shy of 95. He carried World War II with him every day. This truly was the "Greatest Generation". They won World War II and sent humans to the Moon. May future generations rediscover their determination - and vision. Someday I will post the story about how a V-2 came within mere feet of killing my father and what it is like for his son to see descendants of that same rocket send his friends and their inventions within and across the the solar system - and beyond. Doesn't Anyone Remember Space History? By Keith Cowing on December 4, 2018 6:11 PM. By Keith Cowing on December 4, 2018 10:56 AM. By Keith Cowing on December 4, 2018 10:45 AM. Keith's note: Yesterday I posted a Twitter response to a tweet my New Horizons mission PI Alan Stern. This is what it originally looked like in case it is deleted. My response originally said "Strange media strategy for New Horizons #UltimaThule encounter. Mission PI @AlanStern tweets link to his own mission twitter account @NewHorizons2015 - not NASA's mission Twitter account @NASANewHorizons - and then he bans certain media outlets from following his twitter account." 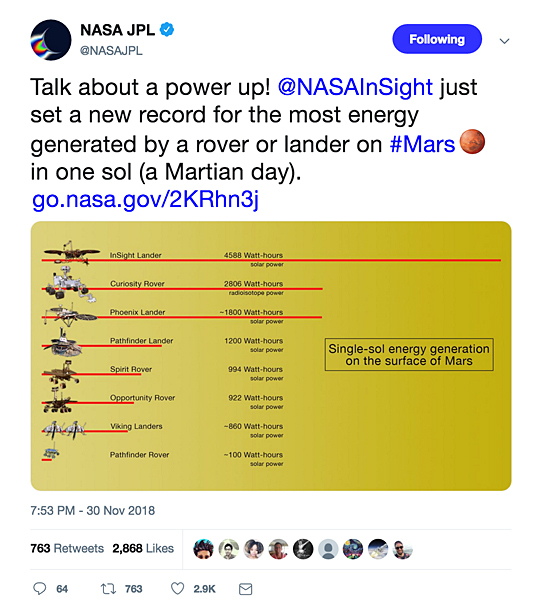 @NASAWatch is still banned from following or reading this Twitter account - an account regularly used by a NASA-funded PI to convey information about a NASA-funded mission. Any annotation about this Twitter account being "personal" is meaningless and is amply contradicted by the way that Stern uses it. It is now (apparently) accepted practice by NASA to allow mission PIs to block access to mission information - as they please. Continue reading A Strange Way To Do NASA Mission Media Outreach (Update). By Keith Cowing on December 4, 2018 10:18 AM. "The Soyuz carrying Anne McClain of NASA, David Saint-Jacques of the Canadian Space Agency, and Oleg Konenenko of Roscosmos launched at 6:31 a.m. EST (5:31 p.m. Baikonur time) from the Baikonur Cosmodrome in Kazakhstan. McClain, Saint-Jacques and Konenenko docked to the space station's Poisk module at 12:33 p.m. after a four-orbit, six-hour journey, and opened the hatch between the two spacecraft at 2:37 p.m."
By Keith Cowing on December 4, 2018 10:15 AM. "The spacecraft executed a maneuver that transitioned it from flying toward Bennu to operating around the asteroid. Now, at about 11.8 miles (19 kilometers) from Bennu's Sun-facing surface, OSIRIS-REx will begin a preliminary survey of the asteroid. The spacecraft will commence flyovers of Bennu's north pole, equatorial region, and south pole, getting as close as nearly 4 miles (7 kilometers) above Bennu during each flyover." By Keith Cowing on December 3, 2018 3:00 PM. "The late, great courageous explorer Neil Armstrong once described his experience listening to a team of lunar scientists debate whether the Apollo 11 mission would result in a one-way trip to the Moon. The fear was the legs of the lunar lander module Eagle would be subject to a magnetic reaction such that significant volumes of lunar dust would adhere to the lander's legs adding so much weight that Eagle would be incapable of taking off to rejoin the command module Columbia circling the Moon and make the trip back to Earth safely. After several days of witnessing the endless debate, Armstrong told the lunar experts that he'd let them know how it turned out when he got back. The upshot of that story was that we knew only a fraction of what we wanted to know before accelerating the Apollo program more than 50 years ago." By Keith Cowing on December 3, 2018 2:45 PM. 1. The Viking landers used RTGs not solar power. 2. Pathfinder's rover had a name: "Sojourner". Do you have Twitter fact checkers at @NASAJPL? By Keith Cowing on December 1, 2018 10:15 AM. "From being the Navy's youngest fighter pilot in World War II and being shot down, to his years of public service in Congress, the State Department, CIA, Vice President and President, there was nothing he wouldn't give for our country and her people. "President Bush's Space Exploration Initiative helped us to think big and long-term about space. His impassioned vision of 'a journey into tomorrow - a journey to another planet - a manned mission to Mars,' helped sustain NASA's early work on the International Space Station, and it still can be felt in our ongoing efforts to send humans farther into the solar system to live and work for extended periods. "The President noted it was humanity's destiny to explore, and America's destiny to lead. We salute this great American leader, who challenged us to chart a course for the future to benefit all humanity." "Aboard the International Space Station, Expedition 46 Commander Scott Kelly and Flight Engineer Tim Kopra of NASA discussed Kelly's year-long mission and research aboard the orbital laboratory during a conversation on Feb. 5 with former President George H.W. Bush, who paid a visit to the Mission Control Center at Johnson Space Center in Houston." This page is an archive of entries from December 2018 listed from newest to oldest. November 2018 is the previous archive. January 2019 is the next archive.